Maybe it's just a coincidence, but I keep coming across the same message lately. 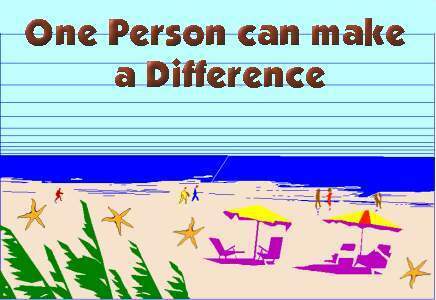 One person can make a difference. I hear it in speeches, see it in newspapers, and find it in books. Maybe it's the type of literature I'm reading, or maybe it's just because spirituality is on the rise. A few years ago my neighbor, Jane, frantically stuffed a newspaper in my hands. "Read this," she said distraughtly. The article was about the socio-economic repression of women in a small Middle East country. They were no longer allowed to speak their minds freely and were stripped of their rights to work outside the home. "We must unite to support each other. An indignity against any woman is a violation against each one of us. We are all connected," she agonized. I didn't understand. Why should I care about what's going on in a country thousands of miles away? A few months later I had the honor of hearing Nobel Peace prizewinner, Elie Wiesel, speak in Minneapolis. His message? We need to help those victimized by human hate crimes. We can no longer turn our backs and pretend that torture and atrocities do not exist. If we allow horrendous crimes to continue, it sends the message that we condone this outrageous behavior. Through involvement each one of us can make a difference he emphasized. Judy Meisel, Holocaust survivor and peace advocate from California, managed to escape death and the horrors of a concentration camp in Poland where she fled to Denmark, relocated to Canada and ultimately to the United States. Today Meisel resides in Santa Barbara maintaining an active schedule as a public speaker extolling the importance of freedom and the need to help each other. "That is the most important. I make every day count. I don't want to hear anyone say, what can I do? I'm only one person. One person can do a lot," Meisel stated with spirit. Forced into the underground when a bomb ravaged her home at 2:00 AM one morning, Sara Pecanac, Bosnian war survivor, not only lost her home, but her friends and dreams. There were days when her only food was soup made from grass. Hunted by snipers with a 400 Deutchmarks reward on her head, she managed to escape triumphantly and move to Israel where she has turned her life around. Sara, who has converted to Orthodox Judiasm, currently works at Yad Vashem museum, lives a comfortable life and is an international speaker telling her story of survival. In May, I talked with her briefly before her speaking engagement in St. Paul, Minnesota. Her message? "You are important. You can make a difference." This reminded me of a story I heard many years ago that took place on a beach. Thousands of starfish were washed up on the shore at low tide. One morning a young man was busily running up and down the shore tossing each starfish, one by one, into the ocean. At the same time another man walked by and said, "There are so many starfish washed ashore, your efforts won't make a bit of difference." It will to this starfish," the young man replied as he picked up another and continued throwing them back into the ocean one by one. I began to think, how can I make a difference in my lifetime? When I look within my heart, I always come up with the same answer. Help others. Get outside of yourself and your problems and help others. Each day I ask how can I make someone's life a little easier? I visit a nursing home, walk the neighbor's dog, give someone a ride, hold doors open for strangers, donate to charity, massage the cat, bake oat meal cookies for a friend, or leave flowers on an unsuspecting person's doorstep. Visiting a lonely person or listening without interruption and judgment goes a long way, too, and it's free. Even a simple "what can I do for you, or how can I help you?" is appreciated. Giving is truly a selfish act. The giver receives an abundance of joy, and the returns greatly outweigh the investment. How much is a smile or an embrace worth? Similar to the credit card ad on television, the answer is "priceless." The other day while walking a friend's dog, I ran into a neighbor who talked about her travels to Russia, Italy and Greece. "I am determined to visit Egypt next," she said. because he saw a lot of poverty." "I'm aware that there is a lot of poverty in the world, but what can I do about it?" she replied. A feeling of discomfort resonated throughout my body. Maybe she is where I was two years ago on the spirituality scale. Maybe a trip to the seashore would be in order. I could begin by showing her how to throw starfish back into the ocean - one at a time.